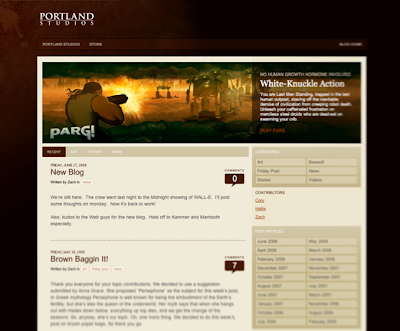 No, not my blog, but Portland Studios, the company I work for has released a new version of the blog. Ka-pow! Blog! Most of the hard work for Comic-Con is done and what remains is the fantastic ramp up to the actual date of the convention. Anybody heading out to San Diego this year? Yet another piece from Ticket, my forthcoming zine. They all should be printed and ready to order in a week or so. 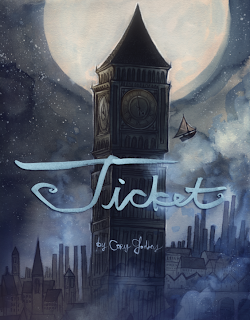 Ticket is a 32 page paperback picture book. 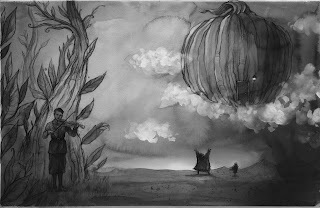 Black and white interior, full color wraparound cover. 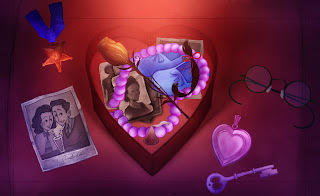 To see most of the previous posts concerning Ticket as well as a couple other pieces, click the top banner to go to my blog and scroll down a little. I was pretty certain with the cover for Ticket, but I'm a little less sure about the title page. The light text or the darker text? Thoughts? *Oh, and there's a tiny gray strip across the top of the one on the right. That's not really there, it's a little glitch in the screen cap. Ticket cover: the early years. Here's the work in progress of the cover for Ticket. I put this together this afternoon. Any thoughts? 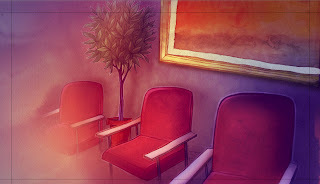 Here is a finished piece of interior art for Ticket. 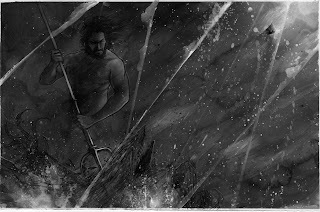 If I were eloquent I'd do what I can to persuade you to buy this book when it becomes available in the coming weeks but I am not that eloquent so this two page spread, spread number six, will have to speak for me. I'm not sure what else to say (or show) that could convince you any further. I am proud of this piece. Here's one of the more different (more different?) 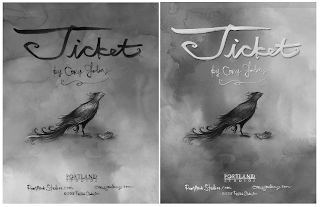 pages from Ticket. It has since been painted. I got locked out of the office a couple months ago. I left my keys on my desk and wandered downstairs to get some soup and when I came back everyone had gone. And locked the door. I went back into the store, bought a pad of paper and a pen and sat down by the door. 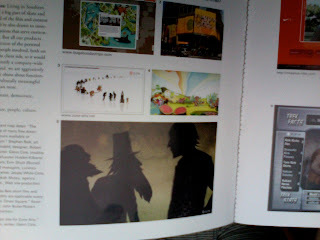 While I sat squinting in the reflected sun off the white paper I made a list of everything I like to draw. 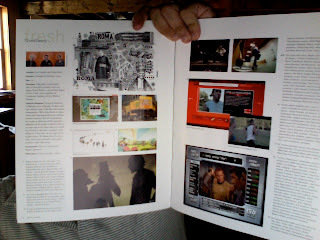 This was right around the time I found out that I'd be doing a "zine" and was putting together ideas for it. 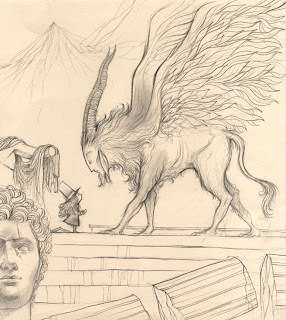 Would it be one of older stories? Should I try to adapt some more "established" story of mine? Or should I try to make up something new. I decided to take an "established" character, Lily von Silvie Lenore, and write a new story around her. 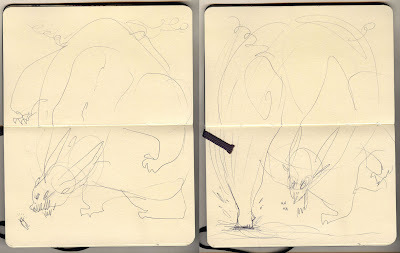 I liked the idea and began scrawling down ideas. Oh, and eventually an intern arrived with a key. I was able to fit about half of the list into Ticket. We'll see if we get a sequel. 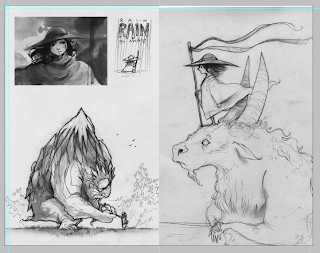 In any case I could not be more pleased with the way this project has shaped up and I can't wait to see it printed. 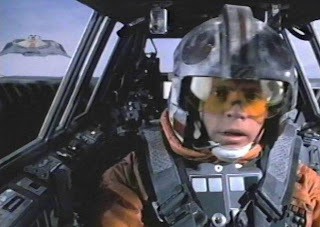 "Oh, Luke we have a malfunction in fire control... I'll have to cut in the auxillary." "Just hang on... Hang on Dak! Get ready to fire that tow-cable!" Ticket is nearing completion. The truth be told, I have slept very little these past several days but I feel like the baddest man alive. I get a huge rush when I hit a major milestone in a project (provided the project is going well) and Ticket is going very, very well. 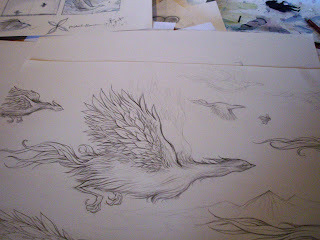 Last night I finished the paintings and this afternoon I've scanned everything and am presently going over it. Just one more day. I've been snapping pictures during the process of Ticket and I'll post them all in the next few days. Where the heck have I been? Man, one whole week. Well, the long story short is that this has been one of the busiest weeks I've worked. So many projects, so little time. 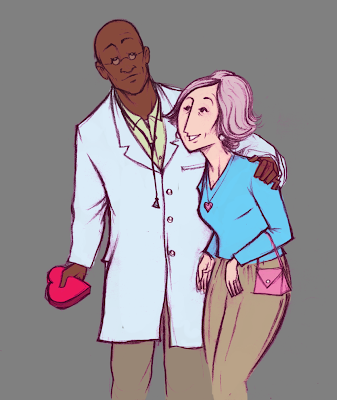 Well, here's a piece from one of my animation projects, a commercial for a hospital. Scroll a little lower for more of the first two commercials. 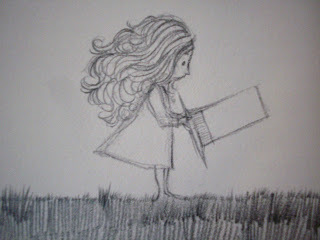 Later this weekend I'll post some work in progress of Ticket. Here's to a busy weekend! Woo! This is an old doodle from around two years ago but the idea still gets me. Here's a collection of a few of the backgrounds for the upcoming "Tift 3"
They don't really give anything way, in fact in this first one I pulled out a few of the objects of the box so you could get a better look at them. Tift 3 has shaped up to be the most ambitious of the commercials. 1 and 2 definitely get marks for being challenging but 3 has some of the most refined, thoughtful animation yet. 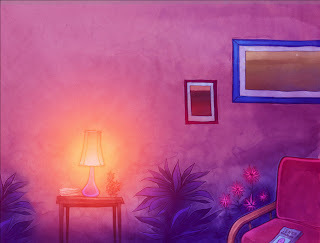 In addition to that, I've poured a lot of time and effort into making the backgrounds. I'm not sure when Tift 2 will be out, I'll be sure and post it when it is, but Tift 3 is what I'm really looking forward to seeing completed. Here's the first of three commercials for Tift that we've done. I made the backgrounds and most of the key frame animation. 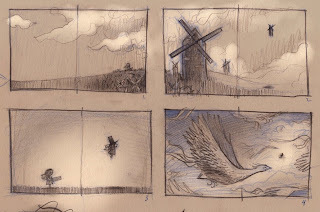 Zach did some key frames and all of the in between animation. Matt S. wrote and recorded the music, Aaron worked on audio, and Matt F. complied everything into AfterEffects. 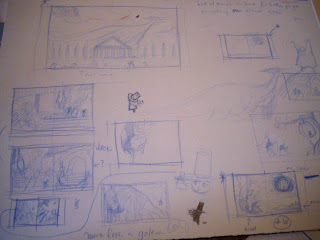 This is our first foray into traditional hand drawn animation. While it's not quite 24 frames a second (wink, wink) we've learned an invaluable amount and it's safe to say the second and third have reaped the benefits of our learning, the third most of all. 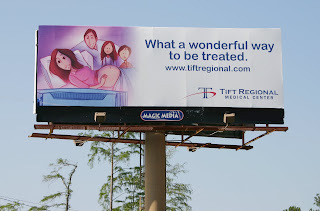 From the first commercial for Tift Regional Medical Center. Forgotten? Hey! How about for starters where are the heck are you? The infant on the left is floating in sea of emptiness like... so many bodies of water... with no fish in them. The confidant child on the right is walking proudly, supreme ruler of his space. Because he actually has space. And dimension. And stuff on the floor. This is for the second of three animated commercials for a hospital I've been doing at work. I did this first one with out any stuff, just ... well ... did I forget? No, and that's the bad part. Somehow I thought it was going to look good. Well it didn't. Now I can say I forgot. But I'm not sure that sounds any better, really. So I made some stuff for baby to have around him. Disaster averted. If I come across any more "forgotten" type things during the day I'll update this post. Have a good Friday. Think of Frīge, wife of Odin. The name Friday comes from the Old English frigedæg, meaning the day of Frige the Anglo-Saxon form of Frigg, a West Germanic translation of Latin dies Veneris, "day (of the planet) Venus." However, in most Germanic languages the day is named after Freyja—such as Frīatag in Old High German, Freitag in Modern German, Freyjudagr in Old Norse,Föstudagur in Icelandic, Vrijdag in Dutch, Fredag in Swedish, Norwegian, and Danish—but Freyja and Frigg are frequently identified with each other. 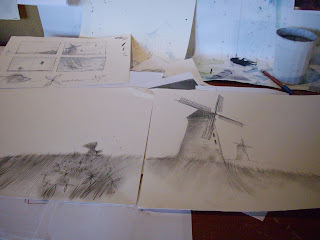 I've the drawings for the first four spreads for Ticket done. 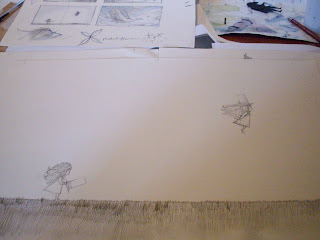 Below you'll find the thumbnails and below that some pictures of the drawings for the first four spreads. Things are going well. A little slower than I had planned but they're going well. I'm going to paint them with watercolors and gouache. I'm pretty excited about the way this is shaping up. I like to listen to movies while I work or documentaries or something. Music doesn't always interest me enough. Here's a link to a previous update with links to explanations for what Ticket is. 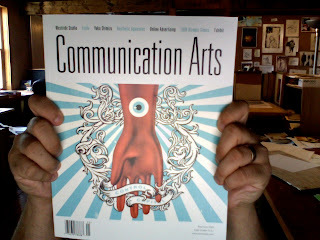 Scored a hot page in the new Communication Arts. Truthfully, this is only note worthy because I'm on the page facing William Shatner.